Our recommendations for vaccinations are based on the kitten/cat's current age and whether it will be indoor only or indoor/outdoor. 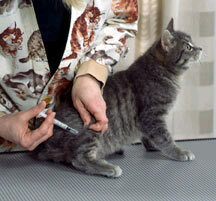 We base our vaccine protocol on the guidelines outlined by the American Association of Feline Practitioners. The Feline Rhinotracheitis-Calicivirus-Panleukopenia (RCP) vaccine is usually started at 6-8 weeks of age (when the kitten is first presented for an exam). This is given as a multi-shot series, every 3-4 weeks until 16 weeks of age. If your cat is over 16 weeks of age and did not receive a kitten series, it should be given two vaccines, 3-4 weeks apart. The vaccines is boosted 1 year later then given every 3 years subsequently. Feline Leukemia Virus (FeLV) vaccination is given to ALL kittens as a 2 shot series, beginning at 9 weeks of age or older. This is boosted for ALL cats 1 year later then only the cats at risk (that go outdoors) continue with annual vaccinations. Rabies vaccinations are started at 12 weeks of age or older. This vaccination is given annually. The vaccine serves several purposes. First, it obviously will prevent your cat from contracting rabies disease if bitten by a rabid animal. Second, it will prevent your cat from being quarantined for a longer period (than if vaccinated) if it bites a human and breaks the skin. Third, if you have to move to a state (Hawaii) or country (ie, New Zealand) that is rabies free, your cat will need to have at least 2 rabies vaccinations at a certain interval. **We use Merial Purevax vaccinations for safety reasons. These vaccines are non-adjuvanted which means that there is no "carrier agent". Vaccine associated sarcoma (VAS) (fibrosarcoma tumor induced by vaccination) is usually due to the inflammation to the adjuvant in the vaccine. Although the incidence of VAS is very low (less than 1 in 10,000 cats) we want to provide your cat with immunity to preventable infections without causing harmful side effects.